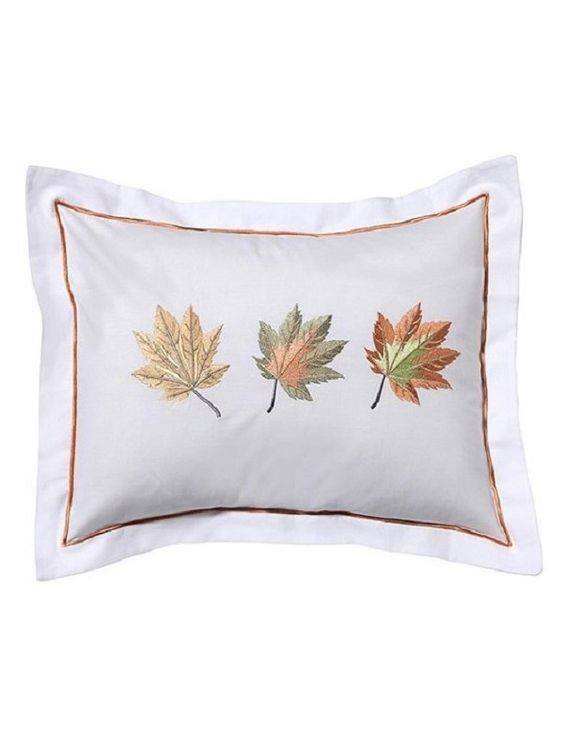 Whether you’re considering buying cotton embroidered hand towels, boudoir pillow cases, or Victorian pajamas, if you decide to purchase custom items made of cotton, you will not be disappointed. Here are some of the many benefits of cotton clothing and linens. 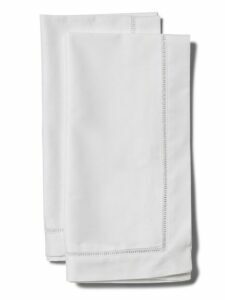 Not having to wash cotton material as much as other linens speaks for itself — what a plus! 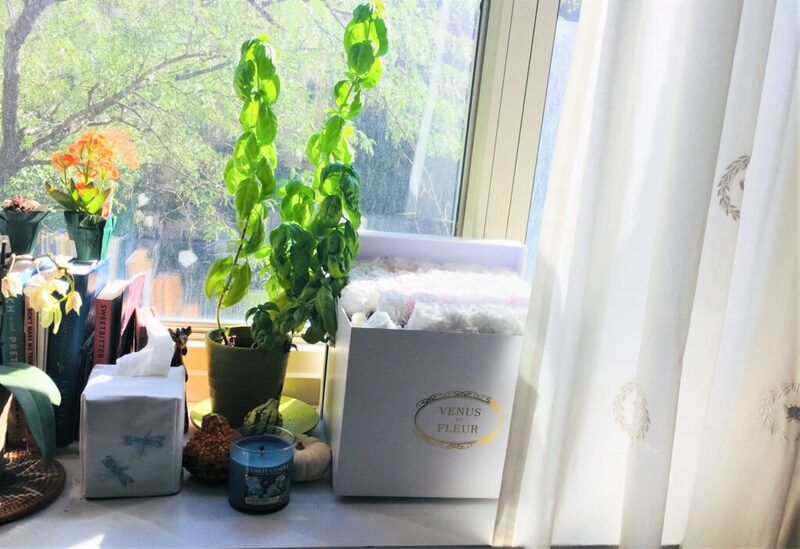 Since cotton is so breathable and doesn’t retain dirt and debris like oil-based fabrics, you can save plenty of trips to the wash. You’ll also save money and water by not doing all that extra laundry, too. Because cotton is so transmittable, moisture is able to be lifted from the body and absorbed into the fabric. Cotton towels are great for drying off because it can take up to one-fifth of is weight in water before feeling even wet at all. A tough material, cotton doesn’t have to be only used for nighttime wear or drying off. Cotton can get really dirty and still work great for an extended period of time. Cotton has a high tensile strength, making it much less likely to rip or tear if anything is harming or stretching it. It’s also 30% stronger when wet. Having custom cotton embroidered hand towels in your bathroom and kitchen will help accentuate your home and give it a high quality look. 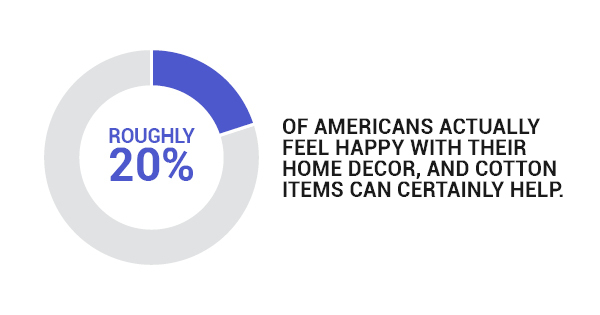 Roughly 20% of Americans actually feel happy with their home decor, and cotton items can certainly help. Don’t forget about stocking your home with other cotton products so people can actually see and enjoy when they stop by. You can be wrapped in cotton material when you’re sitting at a campfire, cooking a smelly dinner, and even when you’re working out, and you still won’t smell afterwards. 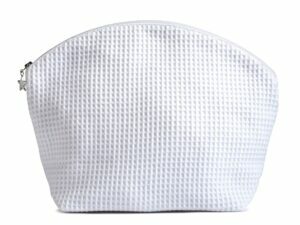 Cotton releases all those unwanted odors and and will feel and smell completely fresh after you wash the material. 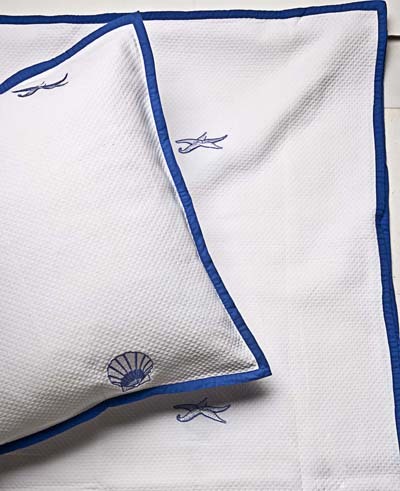 If you want to learn more about the benefits of this great material or find any cotton embroidered hand towels or white cotton pajamas, contact Jarcanda Living today. Your home’s interior is a reflection of your family’s unique character. While home decor styles have evolved, traditional elegance has withstood the test of time. 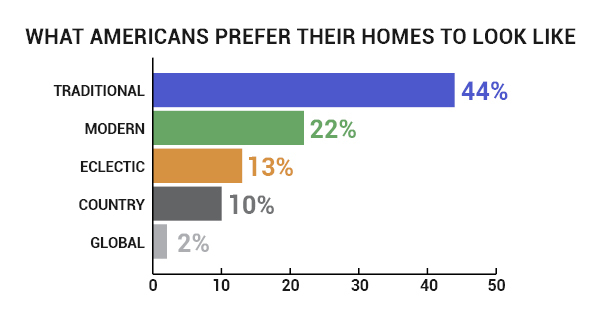 In fact, about 44% of Americans prefer their homes to look tradition. This is followed by modern (22%), eclectic (13%), country (10%), and global (2%). If you are looking to add some more traditional flare into your home, adding embroidery accents can provide a tasteful choice. Few popular decor styles are as traditional and charming as embroidery. 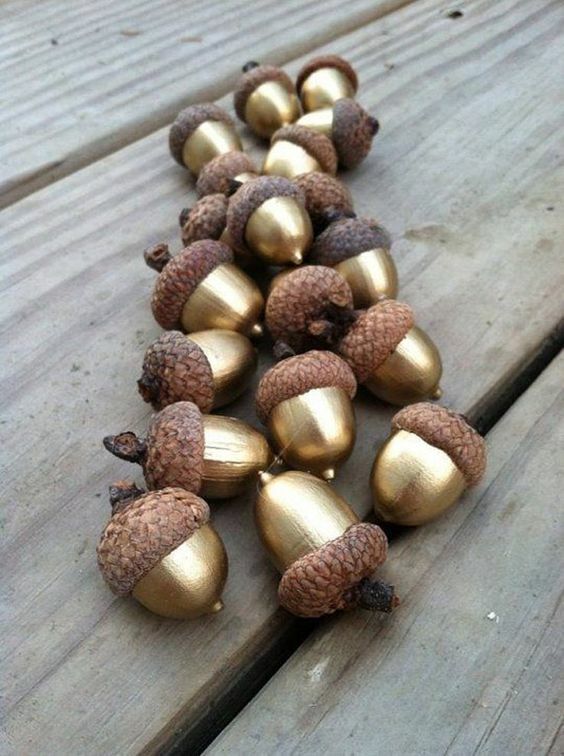 This timeless craft has adorned clothing and home items for centuries. 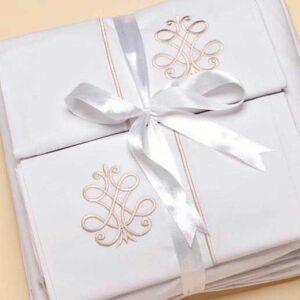 By purchasing embroidered cocktail napkins, tablecloths, pillow cases, and other items from embroidery artists, you are supporting this crafting tradition. What’s more, you are supporting small businesses that strive to spread the beauty of embroidery to all of their customers. Including embroidered accents into your home does not require an overhaul of your decor. There are plenty of subtle, creative ways to make your harm just a bit more charming. Embroidered Cocktail Napkins: Entertaining can be even more lovely. Whether you use them at every meal or just pull them out during special occasions, your loved ones and guests are sure to adore the sweet details on these cocktail napkins. 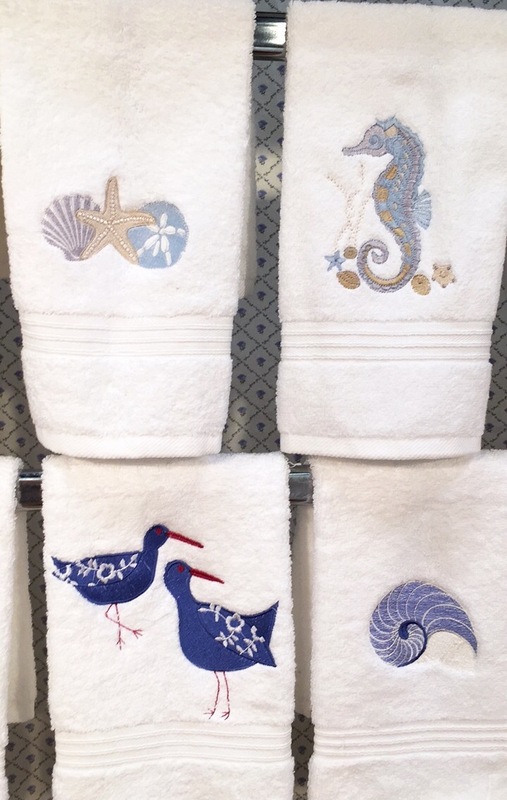 You might consider adding some embroidered hand towels to match. 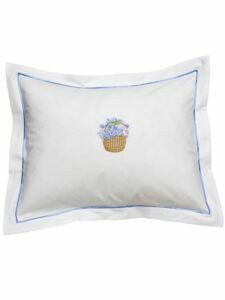 Boudoir Pillow Cases : You’re sure to sleep soundly when you rest your head on embroidered boudoir pillow covers. You may choose to monogram these for you and your partner, or you may prefer a simple floral design. Delicate Wall Decor: Embroidered wall decor has come far from the sewing samples of your grandmother’s childhood. Whether displaying a welcoming message or a delicate design, embroidered wall hangings can add some extra decor into any room. Dining Room Tablecloths: No matter the season, embroidered tablecloths are a great way to tie the room together. They can accent the room while not distracting from the delicious food. Depending on your specific taste and decor scheme, there are seemingly endless ways to use embroidery to complete any room. 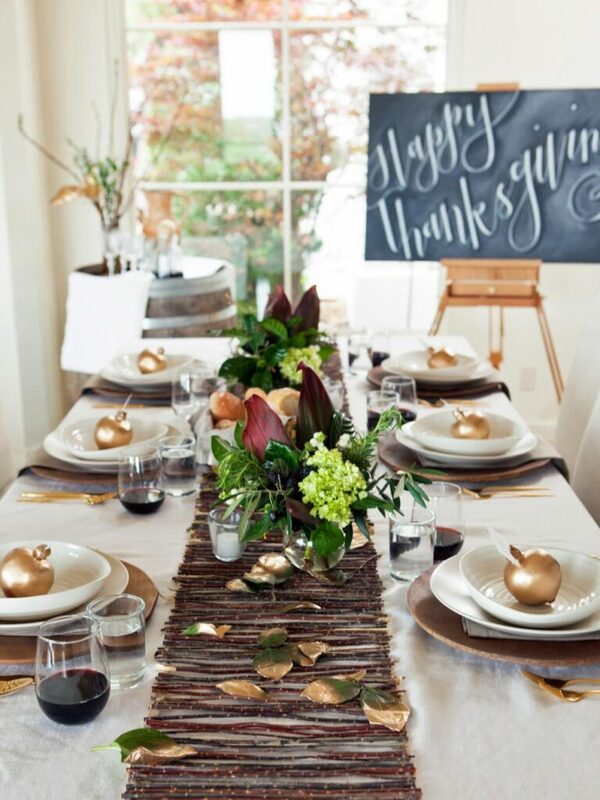 Your guests and loved ones will feel charmed and welcomed by this subtle traditional feel. And once you add a few embroidered pieces, you might just be inspired to purchase more. This week we had a successful trade show at the Javit&apos;s Center in NYC! There were a lot of new and old faces who came into our booth, and we are so pleased with the feedback we received about our newer styles. Thank you to everyone who came out to support and shop our collections. Here is a little recap of what we showcased at the show and to give you a peep of our newer styles that you might have missed! 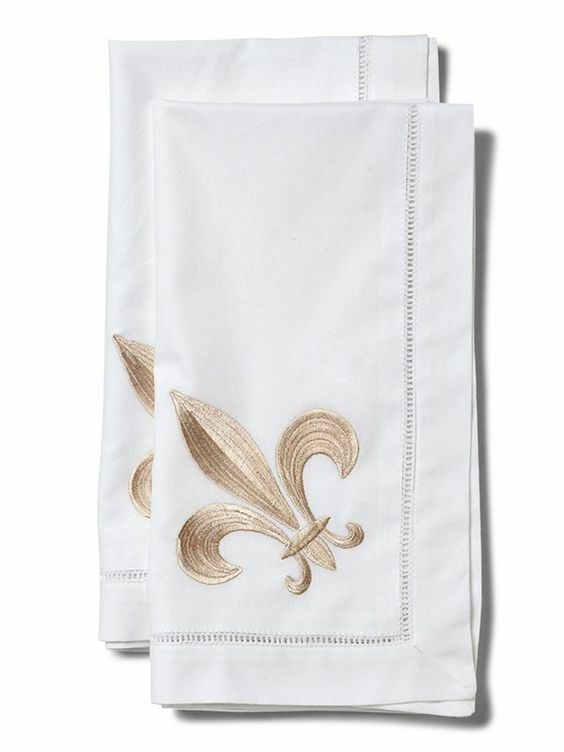 Our embroidered guest towels have always been a customer favorite since we started. 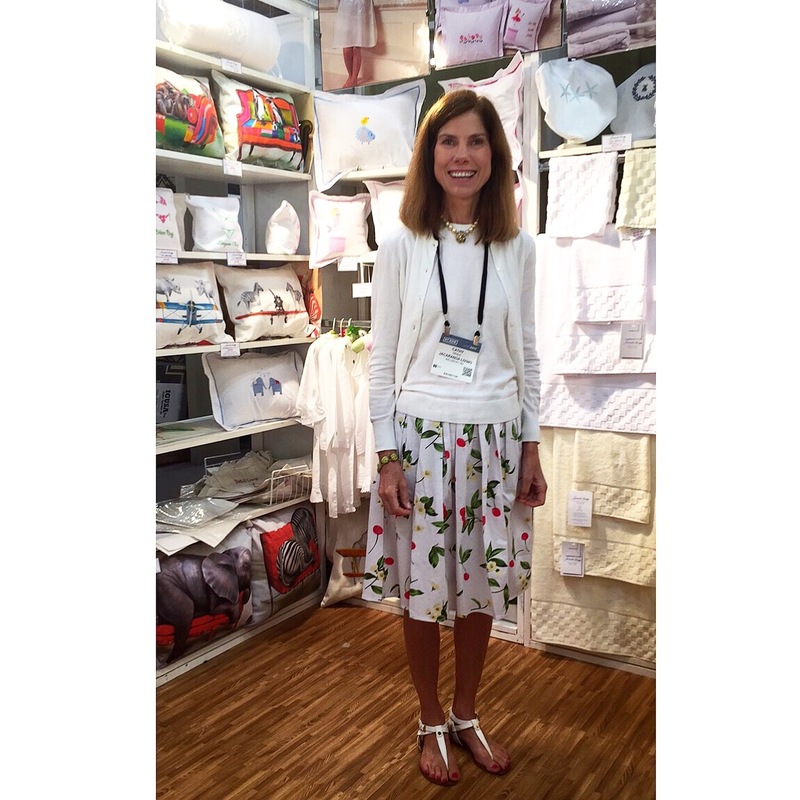 Boutiques in both resort areas and cities do really well with our wide assortment of designs on Waffle Weave, Terry Cloth and Linen. They make a perfect hostess gift and powder room pick-me-up! We recently added some new styles to the collection, which customers have been raving about. We really appreciate your opinions as well as your suggestions for inspiration! The new Sand Pipers were a big hit this time around. We showed them in blue and white, and will be doing them in shades of sand following quite a few requests at the show. We work closely with our team in South Africa who stitch the designs and make each item with meticulous attention to detail. If you have new ideas for a design you&apos;d like to see, we&apos;d love to hear them. 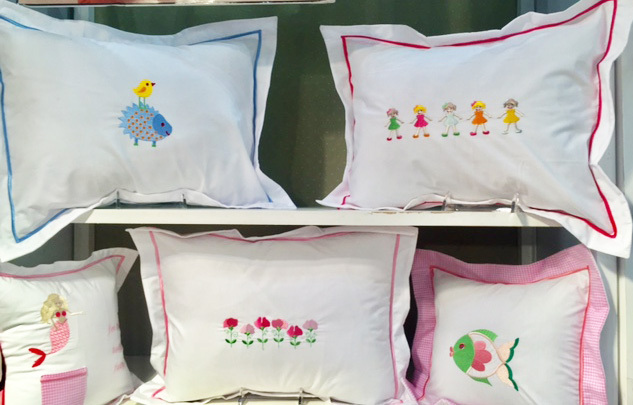 Our embroidered designs on children&apos;s pillows have been growing rapidly! We’re excited to showcase even more playful imagery of kids playing to bring smiles to your little one’s faces. Discover the ones we showed at the show below and let us know your favorite! As you know, we tie most of our designs to our African roots – the very reason we started Jacaranda Living! 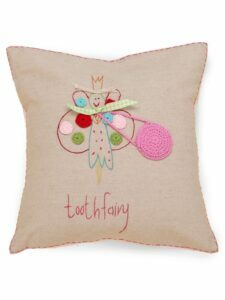 We recently wrote a blog post on our Whimsical Collection and what makes it so special. It just launched and has already been getting a lot of positive feedback. 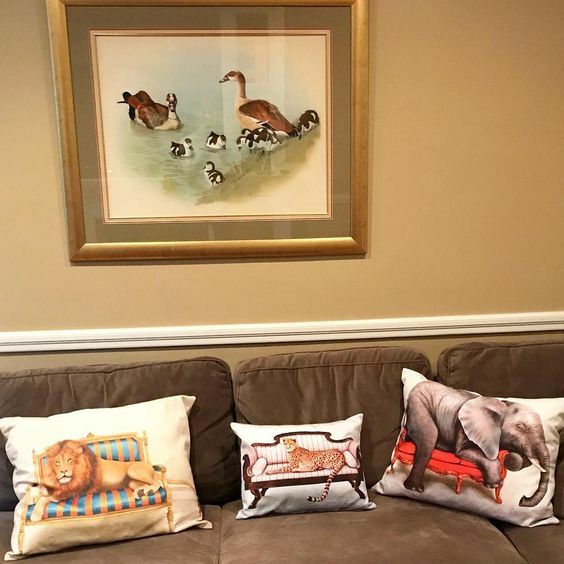 The cosmetic bags did really well, especially the ones of beautiful animals in the wild or whimsically resting on a couch. These cosmetic bags are unique and the ultimate must-have to hold your smaller items such as pens, lipsticks and toothbrushes. Pick your favorite design from our collection here. To round out the last bit from the show, here&apos;s a shot of our favorite new Bucket of Lavender design, which adds a little French accent to the collection. Hold onto those summer memories of yours in our Bucket of Lavender! 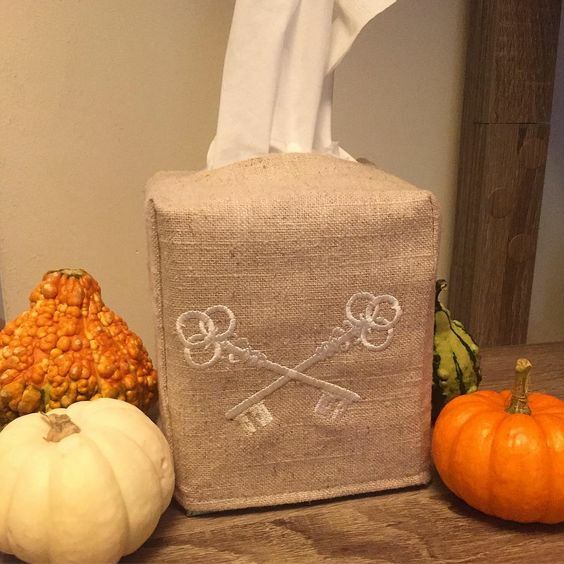 You can shop it on tissue box covers, slippers, cosmetic bags, and guest towels. Thanks again to everyone for coming out. We hope to see all of you lovely people again at the next show. Reach out for any inquiries on the collections, we’d love to hear from you! Not everyone is a gifted crafter. Not everyone can bake, or has the time to make embroidered gifts. Sure, we love to receive homemade fudge, or a beautiful knitted sweater or afghan, but these days most people have a tough time finding the time to wrap gifts, let alone make unique items for family and friends. 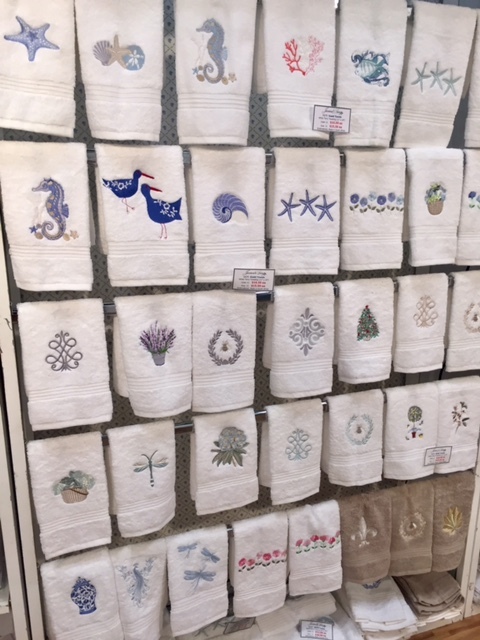 But if you’re a crafter, and there are definitely a lot of you out there, Jacaranda Living has some great embroidered gift items or blank items to be embroidered that will fit right in with your desire to give something special to those you love. Think it’s too late? Not really. 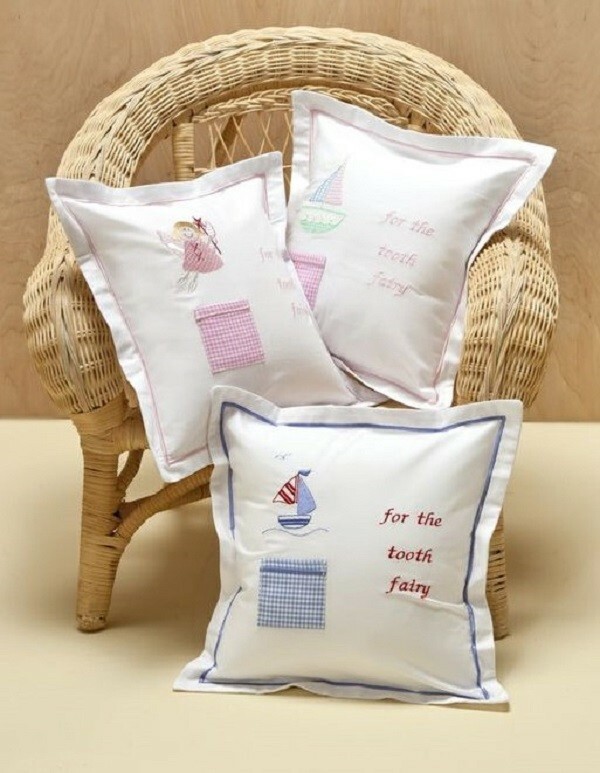 Embroidered or hand painted items can be beautiful as gifts. 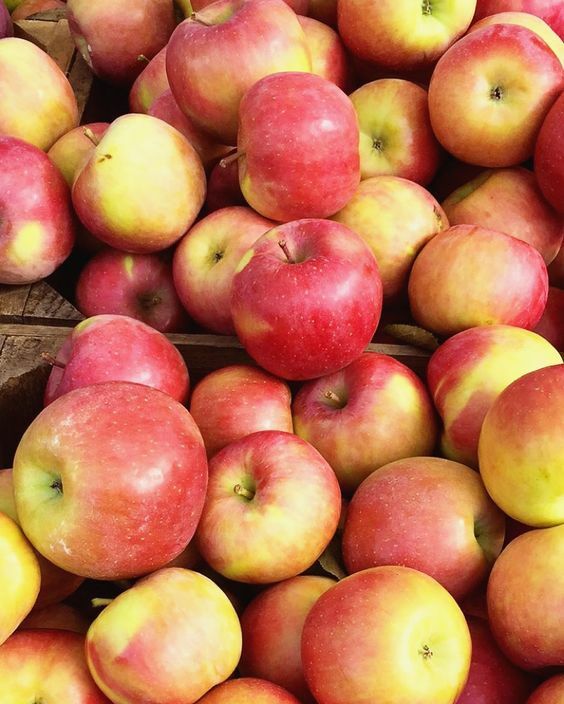 Time may be running out to give a completed item by Christmas or Hannukah, but you can order the item and provide your recipient with a picture of the finished product. Then let them know you’ll be working hard during the winter to create their gift. 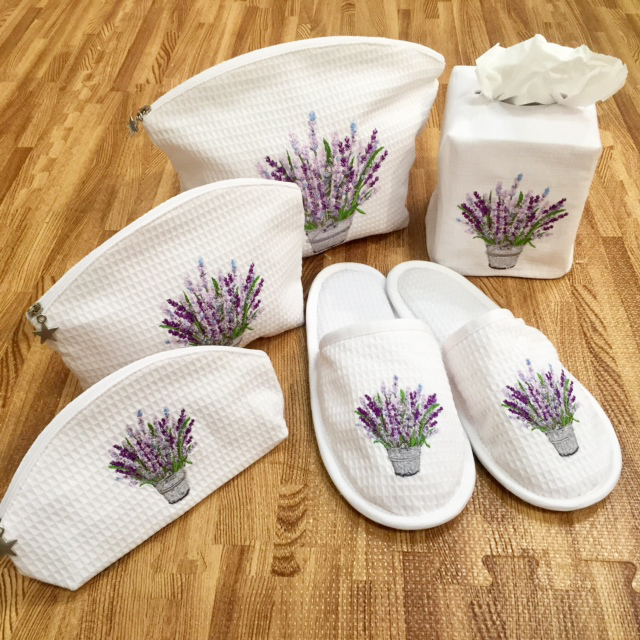 Whether you’re embroidering a cosmetic bag for a friend, or a tissue box for a co-worker, or a pair of slippers for a favorite aunt, Jacaranda Living has a variety of blank pieces ready to embroider that will work perfectly. Not sure where to find the unique patterns that will make your gift the one they treasure? Consider Mary Corbet’s Needle ‘n Thread blog. She’s got great ideas for a variety of designs and even shows you how to use coloring books for inspiration. With so many coloring books out there for adults, you may even be able to ask the person you’re making something for to share their favorite design and you can turn it into an embroidered piece! If you like painting, why not try fabric painting to create a one-of-a-kind gift for someone special? Look for videos on YouTube that show how to paint flowers, and other designs on bed sheets, scarves, and tablecloths. Jacaranda Living has quality cotton napkins, robes, and pillow cases that would work well for this type of project. Just search for “one stroke painting” on YouTube to find a wide variety of projects from easy to complex. and linen, enhanced with lace and fine details that show how much you care. Consider a pretty set for the littlest member of your family, perhaps booties, a hat, a bib and a onesie all embroidered with little sheep. Maybe a sweet cotton springtime dress for a young lady with a love of elephants. Who doesn’t love a cool cotton boudoir pillow and you can have it embroidered with a wide selection of designs including this pretty Nantucket basket of flowers. 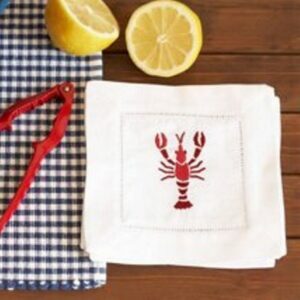 Or put together a picnic basket of goodies featuring these fun lobster embroidered cocktail napkins that would be a hit with anyone who likes to plan an outing with just a bit more flair than the usual. 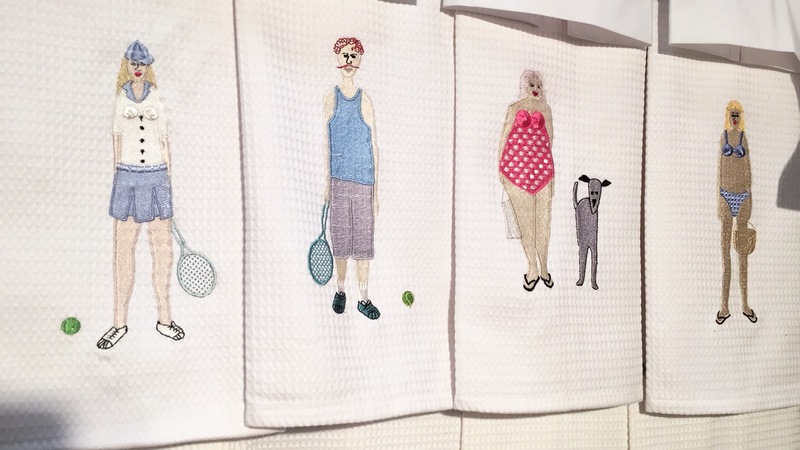 Embroidered linens and handmade gifts show you’ve thought about the person you’re giving to. Whether the gift is something you’ve created, or something you’ve had created just for them. If you’re shopping for gifts and want something personal, consider Jacaranda Living. We’ve got gifts that show people how much you care. The most common suggestion given to insomniacs is to make their sleeping environment more appealing, relaxing and comfortable. This can be accomplished simply by providing your bed with luxurious cotton rich sheets. The benefits far outweigh the cost as you find yourself sinking into luxury as you remove yourself from the distractions of your day and into the comfort of your opulent bedding. Cotton fabrics have a wonderful matte luster, soft drape and are smooth to the touch making your bed more visually inviting. Cotton fabrics have excellent absorbing capabilities, keeping you more comfortable, releasing perspiration quickly, allowing the fabric to breathe. Cotton wears well, will not pill and stands up to abrasions. Cotton can be machine washed and dried. Cotton is a great conductor of heat, providing warmth in the winter and coolness in the summer. Cotton is soft, hypoallergenic and does not irritate the skin. Changing your bedding may positively impact your sleeping habits and your overall health. Everyone functions better after a restful night of sleep. 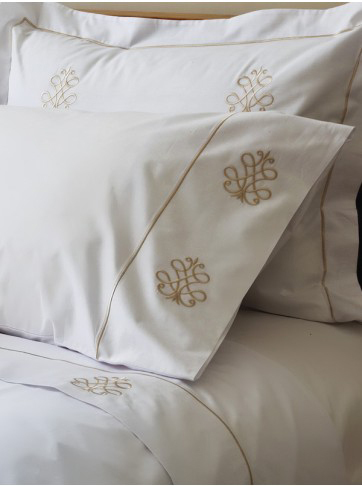 Make your bed as inviting as possible, sleep in luxury, comfort and style with Jacaranda cotton sheets and bedding. 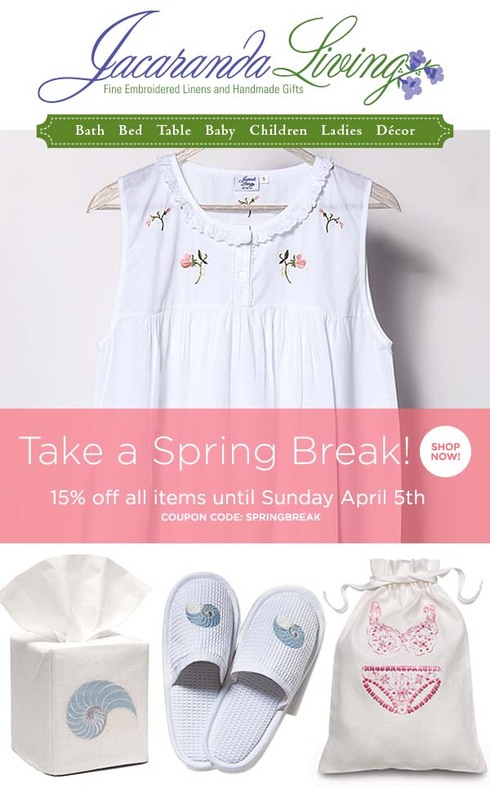 Now through April 5th Jacaranda Living is holding a sale on all our items! 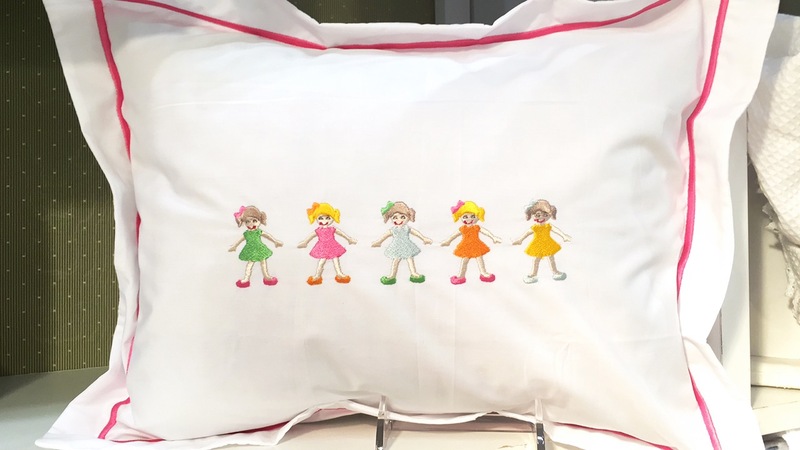 From custom embroidery, to monograms, baby gifts, white cotton nights, custom sheets, home decor, coastal living decor and more! Use coupon code “SPRINGBREAK” at checkout to save! Format ImagePosted on April 1, 2015 January 30, 2016 Author Jacaranda teamCategories Bedding, Bedroom Decor, Embroidery Designs, Gifts for Baby, Gifts for Her, Holiday GIfts, Home Decor, Home Organization, news, Waffle Guest TowelsTags baby gifts, Bath, Embroidery, Luxury Bedroom, Luxury Home Decor, Monograms, sale, Spa, spring sale, spring savings, White Cotton NightiesLeave a comment on Spring Break Sale! Are you a fan of Downton Abbey? Maybe you dream of being Lady Grantham. Mahogany walls, crystal glassware, silver platters and the like. Here’s a few touches to easily add to your home to get that Downton feel. 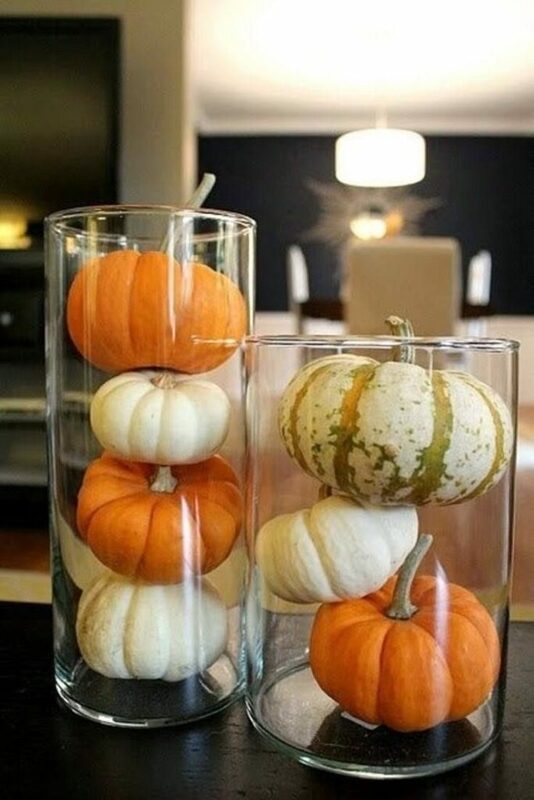 1-Incorporate a few nice china pieces. Whether it’s a small silver valet tray, a wooden tray for serving or a large silver platter, using things like this will give that luxurious feel. 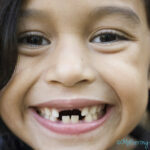 Try using candles and dimmable lights. If you’re not a fan of the open flames, try this battery operated candelabra for the same effect. Light up that fire place of yours for the ultimate ambiance. Enjoy your time there with a cup of tea or glass of scotch. Use this guide to help you with place settings. Accent with charger plates or a nice table cloth and pressed white napkins. Buy an antique piece to put on display, like a sofa table, cast iron bell, or writing desk. While you may not have a large room dedicated to books, consider putting in a bookshelf. Don’t have many books or want that antique book look? Use these “book fronts” that look like old time hardcovers. No, you don’t need silver, but having a nice flatware set that matches and has a classic look will do the trick! If you really want to have some silver, seek some out at a consignment shop. Usually it just needs a good polish to get it looking new. Seek out a nice tufted chaise or leather tufted arm chair. This can be a comfortable place to unwind or read like Lord and Lady Grantham. This leather chaise is perfect for enjoying your fireplace. Come see Jacaranda Living at two upcoming shows and check out some of our new products! On January 8-12, we will be at America’s Mart in Atlanta and February 1-4, we will be at NY NOW. 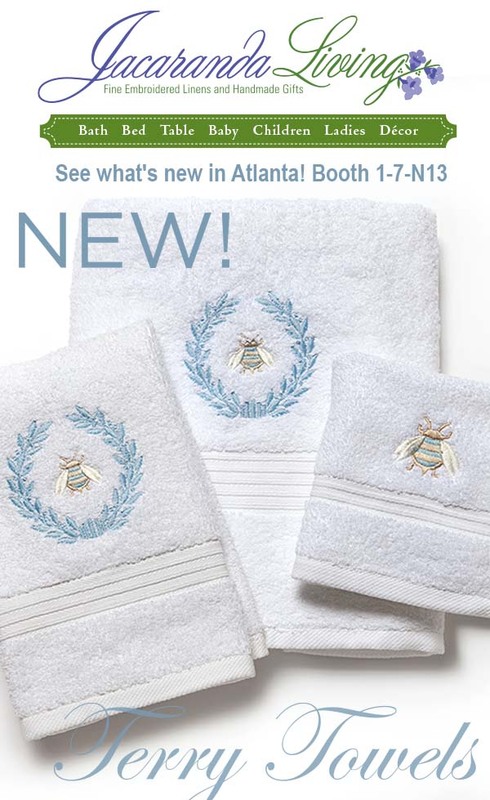 We are launching a new line of embroidered terry cloth towels available with all our embroidery designs! During the shows, you can purchase these items as wholesale. 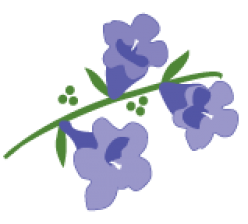 Format ImagePosted on January 7, 2015 January 30, 2016 Author Jacaranda teamCategories Embroidery Designs, Gift Shows, Home Decor, New Product Launches, news, Terry Cloth TowelsLeave a comment on New Product Launch!